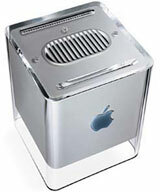 Back in 2000, when Apple released the 450/500 MHz Power Mac G4 Cube, everyone was astounded by the imaginative case design and the ability to later upgrade the unit with faster graphics cards, processors, and more. These upgrades are still available, and with a maxed out G4 Cube, you have a very capable system even in today's demanding computing world. Alas, the cons outweighed the pros. With the price tag being the biggest detractor, and with other factors proving competing G4 units to be better values, the Cube eventually faded away to obscurity, yet it is still highly regarded as a collector's item. The Cube was truly a case of a great concept, but not so great execution. Low End Mac's Dan Knight explains it best in his post-mortem analysis of the G4 Cube in his Road Apple review. If the Cube was such a failure, why bring it back? The logic this time around is not that hard to consider - correct the shortcomings of the G4 version and wow consumers with a great price! Macintosh enthusiasts have always longed for an upgradeable Mac with the initial power of an iMac without the display. The Mac mini comes close but really is more comparable to a desktop version of a MacBook, rather than an iMac, without a display. The mini comes with a nice price tag, but it lacks much hot rodding potential. With a case design and footprint similar to the Mac mini, but just slightly larger and taller (approximately 8" cubed, in the spirit of the original), think about what could be done with an Intel Cube. A Mac mini has plenty packed into a 6.5" square, just 2" high! Imagine how much more could be packed into a device that was 6" taller? This Intel Cube could have an available short length PCI Express Graphics slot (for special graphics cards similar to the G4 Cube solutions). This time, there would even be one expansion slot available (for USB 3.0 or other future expansion possibilities), a tray loading optical drive (maybe Blu-ray finally) up front, a 3.5" hard drive bay for a 1 TB SATA hard drive or a 256 GB SSD (solid state drive), and ports on the rear and front for easy access. The rear ports would include HDMI (1 input, 1 output), dual-link DVI out, S-video out, gigabit ethernet, analog and digital audio out options, 3 USB 2.0, 1 eSATA, 1 FireWire 800, and a power input. The front ports would include 2 USB 2.0, 1 FireWire 400, 1 1 IR port, headphone output, mic/mini jack audio out, and a built-in memory card reader. Internal Bluetooth 2.1 and AirPort Extreme wireless N would be standard. This machine would be your home entertainment server, editing studio, game console, production machine, and more. It would fit nicely into your entertainment center, like a Mac mini, but just a bit taller, and it would drive your HDTV with ease using its high-end graphics solution designed to run cool enough and fit inside the Cube. It would also work nicely on a desktop with a multitude of monitors. Adapters such as DVI-to-Component Video, and DVI-to-VGA for other monitor options would be available. The HDMI input on the device would allow you to take your cable box and capture live HDTV, turning the new Mac Cube into your own DVR. These recordings would be converted directly to iTunes 9 for later playback or could be re-encoded for playback on an iPhone, iPod touch, or PSP. The new Cube would have incredible upgrade potential with a logic board designed to accept new processor cards, such as the new quad-core Intel i7 Mobile as a build-to-order option or future upgrade. Again, the graphics could be upgraded with short length cards, and with the available expansion slot, there would be many more tricks this Cube could do compared to its ancestor. In addition to the graphics card upgrades, a new Apple Remote with gyroscope and accelerometer could become available simultaneously, along with an Apple-branded gaming controller with intense force feedback features designed to work with the newest games. The Apple Gaming Controller would also work as a standard controller on any other Mac with an IR receiver (USB options are available for those that don't have a built-in receiver) and would come in a variety of colors as a throwback to the iMac and iBook colors of yesteryear. Universal drivers would be available for Input Sprocket, and the controller would even work in OS 9, making it the ultimate Mac gaming controller! An Apple-branded wireless keyboard with built-in track pad would be a nice option. It would be like having a desktop with a laptop controller. A built-in over-air HDTV receiver would also be a welcome option and could be controlled through iTunes. This would give you access to HDTV without a cable box and without a third-party solution. It would be perfect if you didn't need cable TV or satellite and you had an older HDTV without a built-in over-the-air receiver. It would also be nice for the office where you may not have access to a TV, but want to take a break and just watch the news on your monitor. RAM could start with 2 GB and be expandable to 8 GB (theoretically more with larger modules) on these machines using two slots. An entry-level PCI-Express graphics card would be standard equipment - or for those who don't need a dedicated graphics solution, but desire the versatility of the Mac Cube, an integrated Nvidia graphics solution would be available, leaving the PCI-Express graphics slot open for later. In addition, state of the art high-end graphics solutions built for heavy 3D gaming would also be available for a premium. Hopefully Blu-ray will arrive as an option with the Intel Cube, giving you access to even more HD content. The Intel Cube would come in a translucent 9" cube case (enclosing the 8" cube unit) with a white polycarbonate enclosure around the hardware itself. Inside the unit and built into the front of the translucent enclosure would be a tiny LCD display. The LCD, perhaps the same 2.5" 320 x 240 one used in the iPod classic, could simulate a glowing backlit Apple logo (this could be toggled on or off). The backlit Apple logo could be displayed in solid metallic, original rainbow Apple, or a multitude of other color configurations and special effects, lighting up the translucent case with a glow and giving the unit a truly futuristic look. The built-in LCD could also be set to display your current iTunes playlist or library, and you could scroll up or down with your Apple remote or gaming controller to change the song or movie you are listening to or watching. The unit configured with integrated graphics, lowest processor speed, 250 GB hard drive, 2 GB of RAM, and no remote, mouse, keyboard, or controller could retail for $799 - the same price as a slightly upgraded Mac mini. This would be perfect for someone who didn't have the money up front (the Mac Pro - the only Mac that uses standard graphics cards - starts at $2,499!) but wanted to upgrade later. If you wanted to max it out right away, an Intel Cube configured with the fastest available processor, 4 GB of RAM, a 1 TB hard drive, built-in over-the-air HDTV receiver, wireless mouse/trackpad combo, new Apple remote, Apple gaming controller, and best available video card would retail for $1,599 - still roughly $1,000 less than a 24" iMac or quad-core Mac Pro with the same features. Either way, you would have plenty of money left over for your monitor of choice when compared to the cost of an iMac, plus you would be able to upgrade it even further down the road!